Before there was “The Resistance” there was mass resistance to the Republican policy-agenda during the George W. Bush administration. During this previous wave of anti-Republican Party resistance, activists aligned with the Global Justice Movement regularly mobilized mass street demonstrations at party conventions and economic summits. 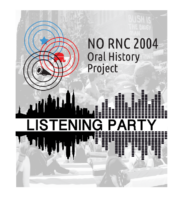 The NO RNC 2004 Oral History Project documents the organizing efforts that led to a month’s worth of events and demonstrations in New York City during August and September 2004. Join project founder David Spataro, project web-developer Manu Mei-Singh (http://www.lineindex.info/), and project narrators for a listening party to hear audio from the project’s first 15 interviews and an exploration of visual materials from the demonstrations. If you have a story (or stories!) that you’d like to share from your experiences at the 2004 anti-RNC demonstrations and/or events, please reach out to David (dlspataro [at] gmail [dot] com).